Everyone’s favorite Dr Seuss holiday character, The Grinch, is at the center of the Christmas celebrations at the Universal Studios theme parks in Orlando. Grinchmas at Universal’s Islands of Adventure tells the story of the beloved character whose heart had been two sizes to small only to grow three sizes at once when he discovered the true meaning of Christmas. The Grinch characters at Grinchmas are modeled after the 2000 hit film, Dr. Seuss’ How the Grinch Stole Christmas, featuring Jim Carey. THE GRINCHMAS™ WHOLIDAY SPECTACULAR is the live show performed each day during the holiday season that happens on-stage and off as the Whos from Who-ville stroll through Seuss Landing and meet with guests. Guests also have the chance to have a meet and greet with the Grinch. 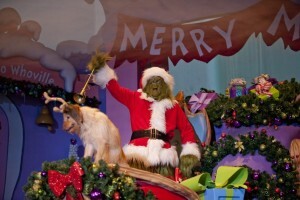 Christmas is celebrated at Universal Studios with a holiday parade based on the Macy’s Thanksgiving Day Parade in New York City. THE MACY’S HOLIDAY PARADE™ at Universal Studios celebrates the season with many of the balloons and floats that have participated in the New York City event where guests can attend a live parade closely resembling the one they have seen annually on tv each year. Mannheim Steamroller, the biggest selling Christmas artist of all time, will be performing at the theme park on December 3rd, 4th, 10th, 11th, 17th, and 18th in 2016 at 7PM.